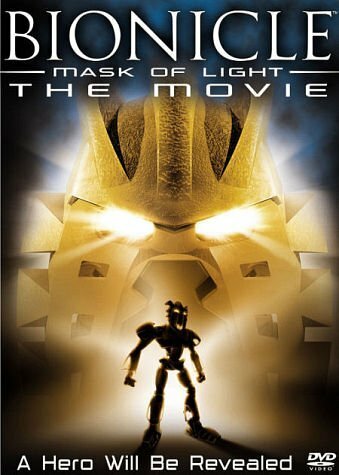 Bionicle: Mask of Light was a direct-to-video 2003 film based on the Lego toy series Bionicle, produced by Creative Capers Entertainment and released by Walt Disney Studios Home Entertainment and Miramax Films. In this new age of realistic looking CGI, it may seem a bit retro to watch a 2003-vintage CGI film, especially one originally intended for a younger audience, but this first Bionicle movie is a real classic in both film presentation and story line. Bionicle: Mask of Light is far more than a kid's movie with a creative setting, interesting characters developed much more fully than most big-screen sci-fi/fantasy fare, carefully scripted and executed cinematography, and a wonderful, big-screen musical score. The Bionicle world is populated with creatures having living tissue inside a mechanical shell, a real "soul in a machine," with a hint of steam punk. The story is the classic quest – the two main characters discover an ancient mask (masks define who the Bionicles are) and seek the "seventh Toa." The Toa are the bionicle world's protectors which represent various elements also represent each of the races on an island called Matanui. (All the names in the film are vaguely Polynesian). Along the way, the chief bad guy, a character referred only as The Makuta, gets wind of the quest and wants the mask for himself. His henchmen are among the nastiest in the sci-fi world (At the time) – a blend of lizard, snake, and creepy crawly thing you might find hiding in your basement. These little evil entities never utter a word as they destroy whole cities. The final showdown not only offers surprising twists, but includes elements of yin and yang, baptism, resurrection, and mythology. As I said, "Bionicle: Mask of Light" is goes way beyond a kid's movie and has great entertainment value. It deservedly won a number of awards, including Best DVD Release of 2004 from the Academy of Science Fiction, Fantasy & Horror Films, the Best Visual Effects in a DVD Premiere Movie, and the Golden Reel Award for Best Sound Editing in Direct to Video from the Motion Picture Sound Editors. Sure, it's an old flick, but if you have a chance to catch it, you probably won't be disappointed.